In this technique, hibernate will ensure that it will use a common primary key value in both the tables. This way primary key of entity STUDENT can safely be assumed the primary key of entity STUDENT_ADDRESS also. The example demonstrated in this post is using shared primary key. In this association, a foreign key column is created in the owner entity. For example, if we make STUDENT as owner entity, then a extra column “ADDRESS_ID” will be created in STUDENT table. This column will store the foreign key for STUDENT_ADDRESS table. In this association, the join table will have two foreign key columns (i.e) it will have both the primary key columns from the two entity tables (for example STUDENT_ID and ADDRESS_ID from STUDENT and STUDENT_ADDRESS entity tables respectively). One of the foreign keys will serve as the primary key for the join table. An unique constraint will be applied on the remaining foreign key column and hence both the foreign key columns will not have the duplicate values. NOTE : Above script is written for SQL Server, you can change accordingly for different DB. Download latest Hibernate jars from here http://hibernate.org/ and add to your classpath. In the above file we have set the database connection to SQL Server database . The show_sql option, if set to true will display all the executed SQL queries on the console. The property hbm2ddl.auto , if set to create, creates the schema, destroying the previous data. Note : In case you want to use any other database then, you need to change these properties – “dialect”, “connection.driver_class”, “connection.url”, “connection.username”, and “connection.password”. Also we have added the Annotation based entity classes Student.java and StudentAddress.java to the above file. Here the saveStudent() method is used to save a new Person object and Address object to the database. In the saveStudent() method a new object of the Student class is created and the name value and address is set. The studentId value is auto generated so the value need not be set here. We then save the Student object to the Address object. The session.save() method is used to persist the value in the database and once the value is saved, the id value (Primary key) is returned. Once the object is saved, the transaction is committed. If any exception occurs then the transaction is rolledback. The transaction ends either through commit or rollback action. Once the transaction ends the session is closed. The getStudent() method is used to list name of each student in STUDENT table and their corresponding addresses from STUDENT_ADDRESS table. Here we use Hibernate Query Language (HQL). The query “from Student” returns a list of all the data in the STUDENT table and their corresponding addresses from STUDENT_ADDRESS table. Note that in the HQL we only specify the java class names and not the table names. Later, using the for loop we iterate the list the data from Student and corresponding StudentAddress table and hence display them on the console. Execute the above code to demonstrate Hibernate One-To-One mapping. If no @JoinColumn is declared on the owner entity, the defaults apply. A join column(s) will be created in the owner entity table and its name will be the concatenation of the name of the relationship in the owner side, _ (underscore), and the name of the primary key column(s) in the owned side. @JoinTable annotation is used in Person class. It declares that a new table STU_ADDRESS will be created with two columns student_Id (primary key of STUDENT table) and addressId (primary key of STUDENT_ADDRESS table). 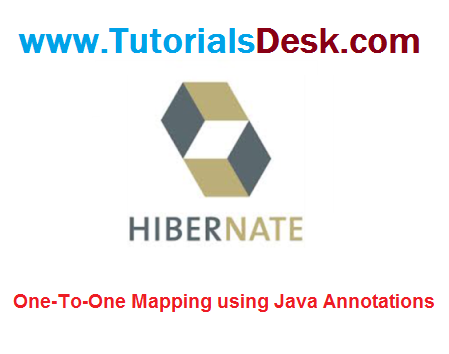 Hope we are able to explain you Hibernate One-To-One Mapping Using Java Annotations, if you have any questions or suggestions please write to us using contact us form. (Second Menu from top left).